Apologies to my faithful readers. Things have been quite difficult lately for a variety of reasons, but I hope they will improve soon, and there have been a number of standout moments that have been splendid, delightful, and utterly rewarding. I use Japanese sushi rice rather than glutinous rice (the thin, extra sticky Chinese or Thai variety) because, well it’s still glutinous, but it’s easier to work with and I prefer the flavour. I cook the rice at either a 1:1 or 1:1.25 rice to water ratio, in a pressurised rice cooker. I usually cook six cups of rice at a time, but with that much water it’s usually enough to let the cooker just get itself up to pressure and then switch it off. As my wife explained to me, it takes so much time to heat that amount of water to boiling point that the rice is already mostly cooked by the time it hits pressure. If you let it go as long as the settings suggest, you’ll burn the rice at the bottom. Mind you, I’m using a very cheap cooker with basic settings. More expensive ones might account for the quantity of rice being cooked. I let the rice cool overnight or until it’s cool enough to handle. I use a sanitised fermenter (Starsan for the win) and rinse my hands in Starsan mix before basically digging out handfuls of rice and chucking it into the fermenter. I do one layer of rice at a time, and for each layer I add one ground up jiuqu or rice-wine yeast ball. You can add more rice as you go to increase the size of the batch. With my last batch I repeated this procedure twice, giving me three lots of rice added over the course of three days. I then put the lid on the fermenter and set it somewhere out of the way. I check on it every day, because I can’t help myself. The mould should start to grow within a couple of days. It should be a white mould, though I have had it go a bit dark and still turn out okay. What has not turned out okay is getting large amounts of green mould. Not a good sign. With this latest batch, I stirred it after about a week, and then left it for about a month. I occasionally dip a (clean) cup into it to taste the wine, and when it tastes good to me, I tip it through a strainer (harder than it sounds), and bottle it (more complicated than it sounds). What makes the straining hard is that the lees can be quite thick with wine, and the temptation is to try to squeeze out as much as possible. It may not be possible. What makes the bottling complicated is firstly the level of clarity you’re after. If you let the wine sit in a container for a day or two it will settle quite a bit. But if you want a clearer wine, you’ll have to use some kind of fining agent. I’ve never tried this, because I don’t mind drinking it rough, and because fining agents supposedly remove some of the flavour. The other complication with bottling will be answered in the next section. * I use a pressurised rice cooker, but you could probably just use a saucepan so long as you do the “absorption” method, on the assumption that it is good to keep the rice grains intact. Traditional and commercial methods apparently use steaming. If you’re going to bottle your rice wine, you need to prevent it from continuing to ferment, as this will not only change the flavour, but can cause the bottle to explode. You can do this simply by keeping the rice wine in the fridge. If you don’t want to refrigerate it, you can pasteurise the wine instead, which I now do routinely. I’ve tried pasteurising at different temperatures: once at 70 degrees Celsius and once at 55. Side by side, the 70 degree wine lost a lot of flavour compared to the 55. I don’t think 55 is a magic number, but you get the idea. What I do now is to heat the rice wine in a large saucepan and bring it up to 55, holding it there for five minutes, and stirring to ensure an even temperature. You can pretty much bottle straight away, but I like to let it settle overnight, then I can bottle from clearer to cloudier. When you’re left with a large amount of rice wine lees it feels like a waste to throw it away or even compost it. In searching for an answer to this same question, I came across the advice that while you can reuse red rice wine lees, for some reason the white lees will not successfully retain the aspergillus oryzae mould required to convert rice starch to sugar. I tried adding freshly cooked rice to a batch of rice lees, and it failed to ferment. I then added some fresh red rice powder to the batch and it subsequently began fermenting. I haven’t yet tried it with red rice wine lees so I can’t confirm that part of the story. Nonetheless, there is something you can do with your white rice wine lees. With my latest batch I decided to see if I could make some kind of rice-flavoured wine for cooking purposes. I put the lees back into a food-grade bucket, and added about eight litres of water and about a kilo of sugar, which I had dissolved into a simple syrup. The yeast loved it, and I ended up adding extra sugar later to keep the fermentation going. The resulting wine tastes like a more dilute version of true rice wine. I’m planning to use it for cooking wine, and will let you know how it goes. This one is tricky. I haven’t tried it. Based on what I wrote above, I suspect the lees would contain yeast, but may not contain the aspergillus oryzae mould required to convert rice starch to sugar. Otherwise the yeast is presumably no different from other yeasts, and there are plenty of sites dealing with storage and reuse of yeasts generally. It’s hard to measure the alcohol level in rice wine because the usual method (hydrometer) won’t work with a solid-state ferment. There are more complex ways to do it, but I haven’t really looked into them. Lore has it that the alcohol content can get “as high as 20%”, which is what I tell people when they ask. Tasting suggests that it is pretty potent. Hope these notes are of some use to other rice wine enthusiasts. Feel free to ask questions and I’ll do my best to answer. About a month ago I read a recipe for home-made rice wine and couldn’t wait to try it. 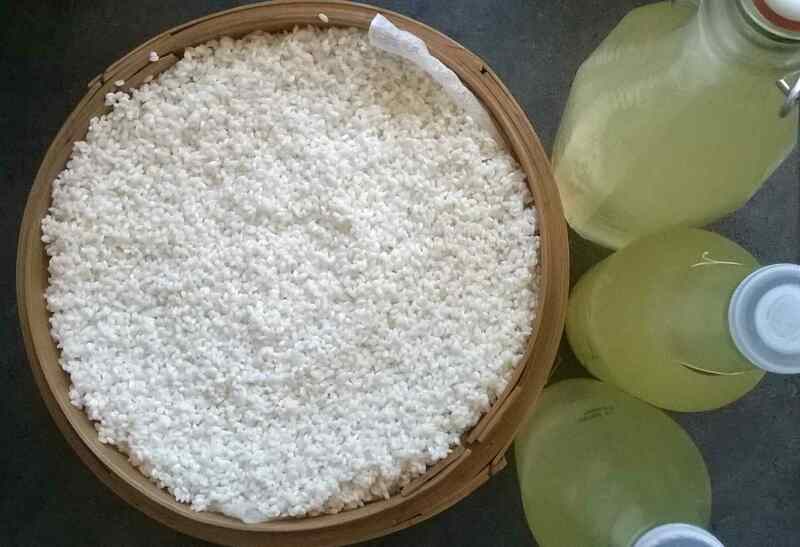 Not only is rice-wine a relatively easy drink to make, it employs an unusual fermentation method and results in a surprisingly high alcohol/volume ratio ranging from 15% to the mid-high 20s. The method at its most basic is almost absurdly simple: cook some glutinous rice, let it cool, then mix it in a large jar or fermenter with a ground up jiuqu or Chinese wine yeast ball. The jiuqu contains not only yeast but also mold, which facilitates a process of ‘parallel fermentation’ or ‘mash fermentation’ whereby the solid mass of rice is simultaneously broken down into sugars by the mold and the sugar converted into alcohol by the yeast. I used 13 cups of Japanese rice (dry) and cooked it in a 1:1.25 ration of rice to water. I’ve read online that a lower ratio of water yields sweeter, lower alcohol wines while a higher ratio yields dryer, high alcohol ones. After 21 days this yielded me more than 2.4 litres of rice wine, though a fair bit of straining was required to salvage this much from the significant quantity of lees. The plan is to reuse the remaining lees in the next batch, for which I am trying a different method of first soaking and then steaming the rice. I’ve never steamed rice before, but it is apparently a more gentle way to cook the rice, though I’m not sure how this effects the fermentation of the wine. It is possible that steaming maintains greater integrity of the individual grains, which would influence the rate at which the starch is converted to sugar. Either way, so far the wine I’ve produced is like a sweet dry white grape wine, with a unique flavour that I think comes from the wine yeast. It’s quite pleasant, though it may be a somewhat acquired taste. I don’t yet have a way to measure the alcohol content, but it seems high to the taste, and a small amount left in the freezer for a few hours failed to freeze. I’ve read that the wine will go sour if left unrefrigerated, so I might try to pasteurise the two smaller bottles and see how they turn out!